There's not a whole lot of e-bikes under a grand, and compromises always have to be made to get the price down. In the Velo XC Raleigh have specced a fairly balanced nbike, and mostly it's a good ride with useful power assistance. However, the fork and the battery let the whole package down. The Velo XC is a one-size step-through frame that'll cater for most riders. Smaller pilots will be more upright but an adjustable stem allows you to tweak the cockpit position a bit. It's a well-constructed frame finished in a pretty tough grey finish, and there's a channel built in behind the seatpost to swallow the wires of the electric system and tidy things up. 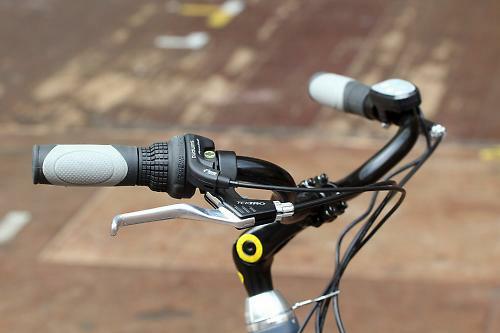 It's mated with Suntour CRV-8 suspension fork and you get a 7-speed Shimano EZ-Fire drivetrain with a twist shifter. The wheels are 26-inch alloy with chunky Schwalbe Landcruiser tyres and full mudguards are included. 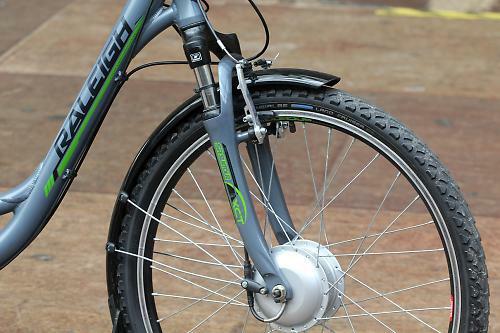 The electric system powers you via a 250W hub motor in the front wheel. 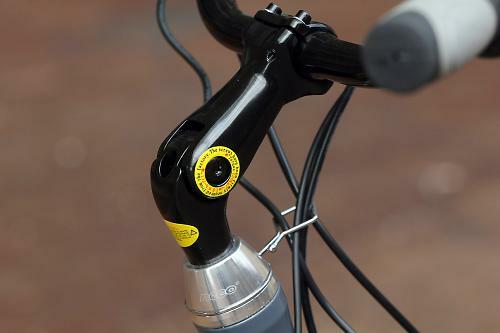 It's pedal assist, with three levels of power available; a sensor behind the chainring monitors when to apply the juice. 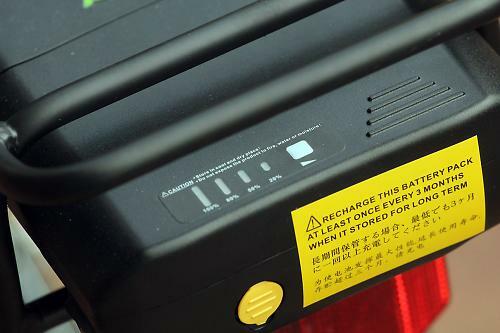 The battery is a rack-mounted 8.8Ah unit which can be charged in situ or removed if you leave your bike outside, or in the shed. Control of the electrics is via a simple bar-mounted panel which gives you three LEDs for battery level, two for power assist (0-1-2 LEDs for increasing oomph) and also a button to switch your lights on. The Velo XC doesn't come with lights but presumably you could wire them in. 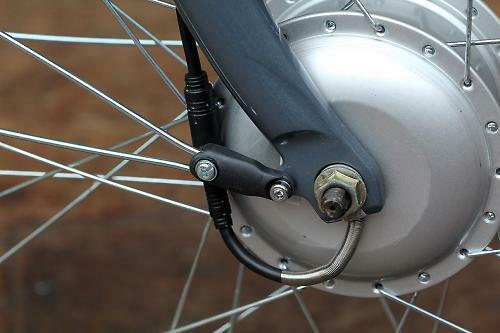 The hub motor is small and quiet, and for the most part the bike's lines are fairly uncluttered by the extra wiring. Controlling the bike is pretty simple: you turn the battery on (or hit the power button on the control if it's already on) and then you simply change power modes by clicking another button. In the bright sunlight the LEDs are hard to see, so sometimes it's difficult to know what mode you're in. The power assist works well in most situations. The sensor does a good job of, erm, sensing, and applies the power accordingly. There's not much lag between pushing off at the lights and getting an extra shove from the motor. 250W is the maximum asistance EU rules allow, and you're only allowed assistance up to 25km/h, but you're unlikely to want to go much faster than that on the Velo XC anyway: it's not a race bike. On the flat I found the power curve to be well balanced, giving you a big shove from the off then relaxing as you get up to speed. It's good on slight inclines too, but on steeper hills it doesn't work quite as well. It seems to reward a significant effort on the steep stuff, so if you put the hammer down on a climb you'll really fly up it. 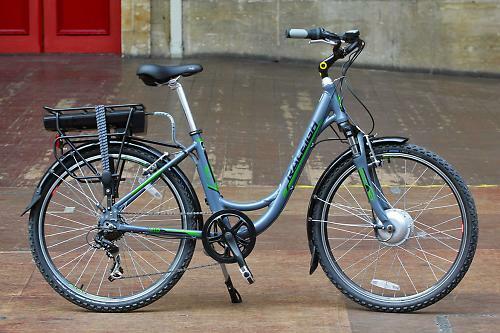 However, if you just want to pootle up – and let's be honest, most of the people in the market for a bike like this will be doing exactly that – it feels a bit under-powered. If you change down to bottom gear and just tickle the pedals as if you were your gran attempting to get up the hill, there's not much help there, even in top assistance mode. It still helps you, but it needs to help you more in that situation if you're going slowly. More expensive assist systems, like the Bosch bottom bracket, do a really good job of getting you up hills without even a second thought. This one needs a bit of work. That's not a deal-breaker, especially if you live somewhere that's predominantly flat, or the hills are gentle. It wasn't the only problem with the bike though. The main issue is the fork. It does a decent job of taking the edge off the bumps but it's simply not stiff enough to cope with the heavy hub motor. Tracking when you're going at any kind of speed over walking pace becomes a bit vague, and the front V-brake induces a whole load of judder in the front end of the bike that isn't very confidence-inspiring. Given that the Velo XC is trying hard to hit a price point, the expensive-and-not-very-good suspension fork is one of things I'd get rid of first. There's plenty enough give in the big tyres and the flexy bars to make it a comfy ride with a rigid fork. The battery was another niggle. I'm not sure if it's able to supply the 8.8Ah of power that it claims (I suspect not), but the monitoring system on the battery is awful. There are three lights on the bar display, and at one point I set off with two lit and the battery was dead less than a mile later. Admittedly that mile was uphill, but even so: it really needs sorting. In the end I resorted to plugging the bike in every other night, which is an easy fix, but a misleading battery monitor is worse than none at all. As such I'm not really sure of the range. Raleigh claim 25 miles/45km; as a heavy rider in a city consisting almost entirely of hills, I wouldn't expect to get anywhere near that anyway. I was probably averaging around 12-15km between charges. If you lived somewhere flat and kept off the full power, I expect you could easily double that. It's one for shorter journeys though. A couple of other minor issues are worthy of note. The front wheel went quite a long way out of true; it was an easy fix but for most people looking at a bike like this would mean a trip back to the shop. One of the pedals worked loose too, although that's possibly down to not being tight enough when fitted, and I fitted it. So I won't mark the bike down for that. Overall the Velo XC is a decent effort but has enough issues to make it difficult to recommend. It's not bad, but unless you're firmly tied to a £1k budget it's worth looking at spending a bit more if you want power assistance. At this price, the compromises start to stand out. Wheelset: Light and Strong Accedo rims. Front motor wheel. Schwalbe Landcruiser tyres. Gearset: Shimano 7 speed derailleur gears with EZ-fire shifters. Finishing kit: Comfort sadddle with elastomer support. Rear Pannier rack incorporating battery mount. They don't really say who it's aimed at. But it's aimed at people who want power assistance, clearly, and at a more affordable price. Frame good, fork not so much. 6061 alloy frame, RST suspension fork. Raleigh don't publish the geometry and it's not hugely relevant. It's an upright town bike. It was fine for general mooching around town. It's certainly a comfy platform with plenty of air in the tyres, a sususpension fork and (for me) plenty of seatpost showing. The fork really lets the bike down in terms of stiffness. No issues with toe overlap. How would you describe the steering? Was it lively, neutral or unresponsive? Slow. The bike is well behaved at low speeds and easy to manoeuvre. Tyres and saddle are good, grips too. Not great at higher speeds but not really designed for them. Easy to pilot at slow speeds, low BB and standover help. Good under power, not as efficient as others I've tried though. Cheap Shimano gears work very well. Weight not really an issue though. Given the low price of the full bike (for an e-bike) it's okay. Front wheel went out of true. Lots of heft but not really an issue. Bars a nice shape, grips good, twist shifter okay. Did you enjoy riding the bike? Not all of the time. Would you recommend the bike to a friend? Probably not. The perceived need for suspension forks on bikes that aren't going to see any 'proper' off-road is a really unfortunate thing IMO. 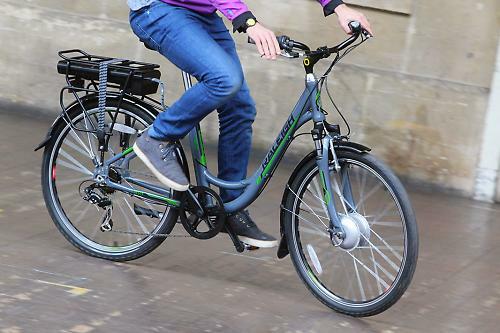 Agreed, too many manufacturers seem to spec these on hybrid bike that would be much better (lighter, cheaper, more fun) that would be much better served with a rigid fork. What's the point in your comment ? By the way, I like your name. After all, what's the use of a ship without water ? Itwas accidental and meant for another post within Road.cc I just got a bit giddy with the back button and wrote a comment on this article instead of the one it was intended for.